Halloween has come and gone, Thanksgiving is right around the corner, and the Holiday season will be here before you know it! Don't forget to take some time for yourself during the craziness of the holidays. You should be able to enjoy your hobbies whether it be crafting, baking, sewing, or home improvement projects, without the frustration of searching for all of the small components. Organizing small items is always a challenge but Sterilite's divided storage is the solution for all of your small storage needs. We can all benefit from taking a little time away from the hustle and bustle this holiday season to relax and create. Storing small items has never been easier than with the Small Divided Box – the perfect portable solution! The slim, space-efficient shape fits easily into most desks and drawers, as well as backpacks and briefcases. The divided design is ideal for neatly organizing smaller items and the durable latch tightly secures the lid to the base. The Small Divided Box offers helpful features such as the hinged lid, clear base, and the ability to stack on top of one another. This on-the-go storage solution will keep supplies easy to access and is perfect for today's hectic lifestyles. The Small Divided Box is designed to fit supplies for all ages – from grade school to adults – such as pens, pencils, markers, highlighters, paint brushes, office supplies, scissors, and crayons. Another great option for your small storage needs is Sterilite's Divided Case. This multi-purpose clear storage solution is ideal for crafting, beauty, office, and hardware organization. The three tinted trays are removable and allow you to create a customized storage space. The longer trays will fit your paintbrushes, scissors, hardware items, and other tools, while the six-compartment tray is perfect for sorting and containing smaller items. Colored latches keep your contents secure, while the hinged lid opens easily. The best part is that the lid stays attached so you no longer need to worry about misplacing your lid. Stack & Carry Handle Boxes are the perfect grab and go containers! They feature a sturdy grip handle for easy carrying and recessed lids that make for exceptional stacking capabilities. The latches securely lock each layer into place and allow individual layers to be easily removed for quick access to items. The larger Stack & Carry has two layers and accommodates 8½" x 11" paper, making it ideal for a school, office or craft room organizer. The smaller Stack & Carry contains three layers and features a removable divided tray. 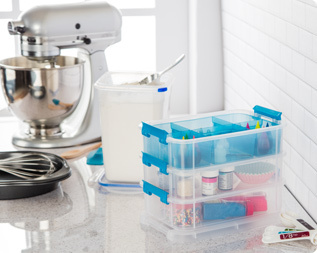 It is perfect for organizing your baking or cake decorating supplies! What are you waiting for? Don't let the frustration of searching for small missing components keep you from doing what you love most. Get organized today with Sterilite's divided storage containers! 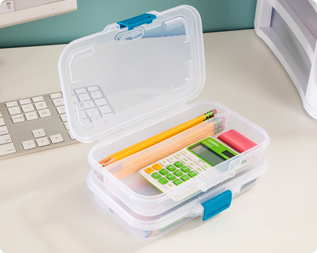 The Small Divided Box is the ideal grab and go solution for school, work, crafting, and more. 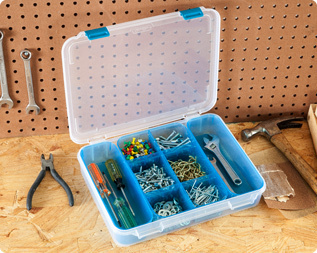 Perfect for the garage or workshop to keep all of your hardware items organized. Our Stack & Carry organizers are great for the kitchen to store all of your baking and decorating supplies. Don't Forget to Set the Table! Does Your Storage Stack Up?